One of the main missions of the SLS, NASA’s future monster launcher, is to launch the Orion spacecraft, a little different from the capsules that Microsoft Boeing and SpaceX have created for NASA. Indeed, Orion is primarily thought for the missions beyond the low orbit, which is new since the Apollo program. The 2003 Space Shuttle Columbia accident asked the question of what should be done to US manned flight programs. As early as 2004, the Bush administration launched Vision For Space Exploration, which will soon give birth to the Constellation program. After 30 years confined to the low orbit, US wishes to resume manned flights to other bodies than the Earth, with the moon as the first objective. This project is complemented by the development of new launchers and a new vehicle for manned flight, known at the time as Crew Exploration Vehicule. 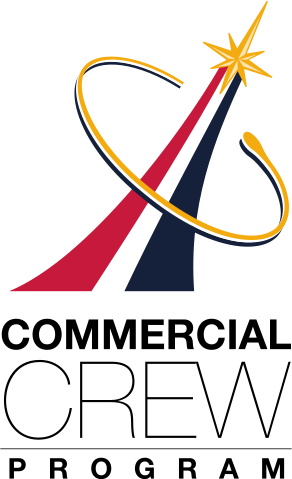 NASA is launching an invitation to tender from its usual partners in the competition : two major consortiums led respectively by Northrop Grumman and Lockheed Martin. Several concepts compete. The first question to solve is the format that must be given to vehicles : rather orbital plane or rather capsule. The recent setback of the Space Shuttle has left a bitter taste on the side of the American space administration, which therefore resumes a concept similar to that of Apollo capsules. This is one of Lockheed Martin’s proposals. The concept is so similar to Apollo that you have to study the capsule well to see the differences between the two spaceships. The capsule, renamed Orion, has a very familiar silhouette for space history enthusiasts. The resemblance to Apollo is easily explained : the laws of physics remained the same between the 20th and the 21st century and the shape of a capsule is optimized in the same way for an atmospheric reentry. However, Orion is far from being a true copy of Apollo : in 50 years, NASA and its partners have gained a lot of experience, which is visible in the design and capabilities of the new capsule. It is a little larger and much more massive than the Apollo control module, which allows it to embark an additional crew member. The Orion capsule also has solar panels, while Neil Armstrong’s ship had batteries and fuel cells. During the second half of the 2000s, a mission architecture became more precise : the Orion capsule and its service module had to be launched by an Ares 1 rocket towards the low orbit with four astronauts on board. Once up there, it is put on stand by. Shortly after takeoff of Ares 1, a much more powerful Ares 5 rocket launches the lunar module Altaïr and the propulsion for the lunar voyage. This two-stage launch makes it possible to send a considerable payload to the moon. After an appointment in orbit, the three modules are propelled towards the moon by the second floor of Ares 5. The first lunar missions included one-week stays for the four astronauts on the surface of the moon. These stays could have been extended to six months thanks to the increased capabilities of the rockets and modules of the program. Finally, the monstrous power of Ares 5, superior to all that exists or all that is planned today (even the BFR), would have allowed the Martian trip. These projects are fantastic, but the Bush administration wants to renew the Apollo adventure without giving Nasa the budgets of the time. Barack Obama, on his arrival in power, puts an end to the Constellation program, considered underfunded, too late and unrealistic without a significant increase in the budget of NASA. But Democrats and Republicans agree on going beyond low Earth orbit. With the program Constellation canceled, the development of Ares rockets is stopped as well as the lunar module Altaïr. But the Orion capsule and its service module are guarded by the Obama administration. The spacecraft’s design undergoes some modifications and a new mission is assigned to it : Orion will be used to bring astronauts in the neighborhood of an asteroid for a mission of collection of samples. The long-term plan is this time Mars but without going back to the Moon beforehand. To take Orion, the development of a new launcher starts, the SLS. While waiting for the laucher still developed by the Lockheed Martin consortium, Orion was tested in 2014. It is a Delta 4 and Delta 6 rocket that takes Orion for the first time. It is an unmanned test flight. During four and a half hours, the spaceship makes two orbits around the Earth and a high-speed atmospheric reentry. The spaceship is not really finished at this date : the design of the capsule is almost finalized but the service module has to be finalized. It is, however, the only Orion flight. Despite the advance of development, Orion is still delayed with the new change of US President. The Trump administration is putting back the moon at the center of the US manned flights program. But this time, the tools put in place under the previous government are preserved. Orion has a third mission, which is a lot for a spaceship that has never made operational flights. In the new plans, Orion allows a return to the moon but in a way very different from what the Bush administration proposed. 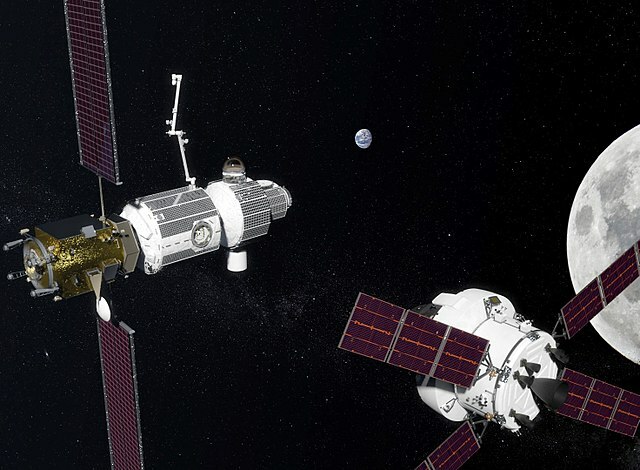 The US space agency wants to create an orbital station near the moon. This station can serve as a starting point for all human activities on the moon. It is called the Lunar Orbital Platform Gateway (LOPG). Orion’s new role is to travel back and forth between the Earth and the LOPG. In its final configuration, Orion is a two-part spaceship. The pressurized capsule, also called control module, allows to welcome the four crew members. More spacious than Apollo, it offers a living space of almost 9 cubic meters. It is also the only part of the spaceship that returns to Earth. To achieve this, it is equipped with a heat shield capable of withstanding atmospheric re-entry at nearly 40,000 km / h. Orion is also equipped with a service module that includes all the ancillary functions of the spaceship that are dropped before returning to Earth. Part of these modules will be provided by the European Space Agency and built by Airbus, which will build on the experience gained by ESA with the ATV cargo ship that served the International Space Station between 2008 and 2014. The service module includes a propulsion system with 9 tons of propellants, solar panels capable of providing the necessary electrical power and nitrogen and water reserved for the crew. Together, Orion’s command and service modules will have a take-off weight of almost 26 tonnes, plus the eight-tonne life-saving tower. The development of Orion has been long and laborious. It took only two years between the launch of the Apollo 4 test mission and the first step on the moon, while there will be almost ten years between the Orion test flight in 2014, very similar to Apollo 4, and the first mission to fly over the moon planned for 2023, if the schedule is respected. 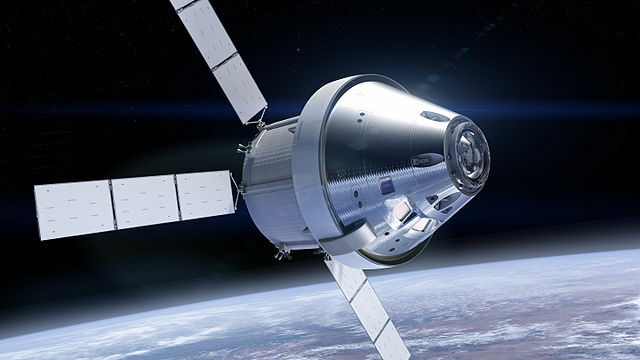 Orion will be launched in 2020 but unmanned. The first third of the SLS will carry the spacecraft for a fully automated three-week flight. The spaceship will spend six days in lunar orbit. Airbus will quickly deliver Orion’s first service module to NASA. 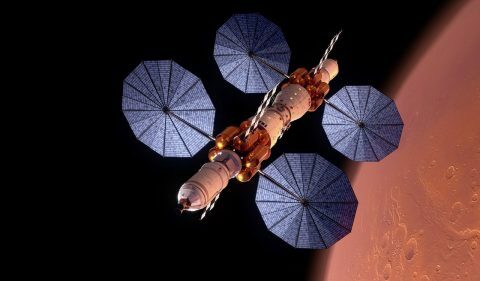 Orion should be sought after for its manned missions in the 2020s. This will mainly involve assembling and serving the LOPG. But nothing can predict whether the next change of US government will change the program again or not. But even if it happens, Orion will born because the ship is too advanced in its development to reasonably justify a cancellation. Orion will send men a little further than the low orbit. But Lockheed Martin’s spaceship is not the only one on the niche : Chinese and private companies could overtake Nasa if delays accumulate.